I have been a subscriber and user of “The Great Courses” offered by The Teaching Company over a period of fifteen years. The Teaching Company, located in Chantilly, Virginia, was founded in 1990 Thomas M. Rollins, a graduate of the Harvard Law School. The Teaching Company offers the Great Courses” using a series of lectures on a selected topic. The topics cover almost the entire range of liberal arts learning, from history and philosophy to physics and astronomy, as well as many courses that deal with practical matters, such as photography, entrepreneurship, woodworking, and painting. A course consists of series of lectures that are usually one-half hour in length. Courses may consist of 12 lectures, or 24 lectures or even 64 lectures. The courses are taught by the best professors or experts in a particular field. The professors are usually those who have been given “Best Teacher” awards from their respective colleges or universities. My usual fare of courses have dealt with history, biography and science. 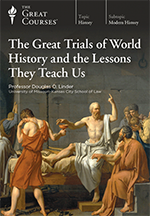 Recently I came across a new title, “The Great Trials of World History and the Lessons They Teach Us,” taught by Professor Douglas O. Linder of the University of Missouri – Kansas City School of Law. He has received his law school’s highest teaching award twice. I decided that Professor Linder’s course of 24 lectures would be a good investment for learning more about trials, judges and courts and ordered it. The course as a whole will be far-reaching and kaleidoscopic, revealing how societies across the globe throughout history have used trials to resolve key issues and decide the fates of evildoers, abuser of powers, champions of free speech and innocent people caught in the wrong place at the wrong time. We will end our tour of great trials with thoughts about how famous trials can educate, entertain and still resolve questions of guilt and innocence – and thus come to an understanding of what makes a trial a great trial. The entire course is ready made for a judge seminar or round-table discussion of the cases and their relevance to judicial life. The course comes with guidebook that provides a synopsis of each lecture, together with a list of questions to consider for those who want to discuss the trials with colleagues or participate in a seminar. The web site for The Teaching Company and The Great Courses is www.thegreatcourses.com where information about the 690 courses and their costs can be found. The Teaching Company also offers these courses in a streaming format for computers and tv/video.